Seven (7) members of the Capital City Dragons (CCD) youth dragon boating team have been selected to represent the United States at the 12th International Dragon Boat Federation (IDBF) World Nations Championships in Welland, Canada. 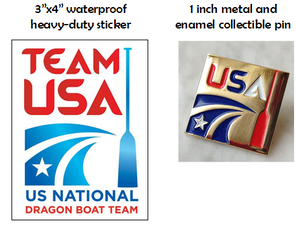 The selection of these youth to the US National Team recognizes their hard work and dedication to the sport of dragon boating; however it would not have been possible without the support of the larger DC area dragon boating community, their coach, and their fellow Capital City Dragons’ teammates. Dragon boating is truly a team sport. One person cannot succeed on their own as it requires 19 other paddlers coming together in the boat in order to reach their goals. Funding the “Road to Welland” for these youth paddlers is estimated at over $1000 per paddler. They do not receive sponsorship or funding. Donations are greatly appreciated if you would like to help these youth reach their dreams of gold. As a token of appreciation, ALL donors (regardless of amount) will receive a signed Thank You photo from the Team USA youth paddlers following the competition. Donations by check can be made payable to "Capital City Dragons"
Special Thank You to our anonymous donor for contributing $2000 to help these teens on their Road to Welland!